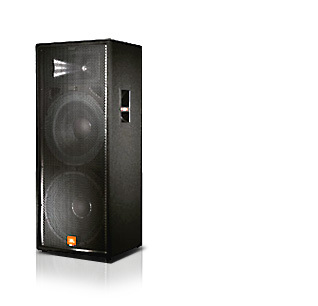 JBL JRX125 Dual 15" Two-Way Sound Reinforcement Loudspeaker System DJParts - All Variety of Parts that DJ Needs. Dual JBL low frequency drivers with a 64 mm (2.5 in) diameter edgewound ribbon voice coil which provides more crosssectional wire area in the voice coil gap than round wire designs, for greater efficiency and power handling. Ferro-fluid cooled compression driver with titanium diaphragm improves high frequency performance as well as system reliability. The advanced network topology crossover design shapes frequency response and delivers coherent summation in the crossover region. A "Quasi 3-Way" design offers the extra bass for which a dual fifteen system is designed, but without sacrificing performance in the critical mid-range. The upper woofer produces mid-frequencies and bass, while the lower woofer concentrates on bass only. The reduction in mid-range phase cancellation greatly improves midrange sound quality and coverage. Progressive Transition™ highfrequency waveguide provides superior coverage control, reduced distortion, and smoother frequency response. The rugged, acoustically superior enclosure is constructed from 19 mm (.75 in) MDF (Medium Density Fiberboard) using advanced adhesives and mechanical fastener technology for extreme durability and improved low-frequency performance. Non-resonant, all-steel handles are used. Attractive 18-gauge perforated, steel grille protects components from damage.